Warwick (pronounced 'Worrick', pop. 23,000), on the River Avon, is the county town of Warwickshire. The town is famous for its Tudor architecture, and above all, its castle, which doesn't hesitate to advertise itself as 'Britain's greatest medieval experience'. Warwick is also reputed for its university, which, despite of being of the country's newest (founded in 1965), has quickly established itself as one of the best, notably in the fields of mathematics, computer sciences, business and horticulture. The town was founded in 914 by the Mercian as defences against the Danish invaders. The original meaning of 'Warwick' is "dwelling by the wier". The town was made the administrative centre of the local shire by the Normans, and it remained under the control of the Earls of Warwick during the Middle Ages. In 1694, a great fire destroyed much of the town, so that most historical buildings left in the centre only date from the 18th and 19th centuries. 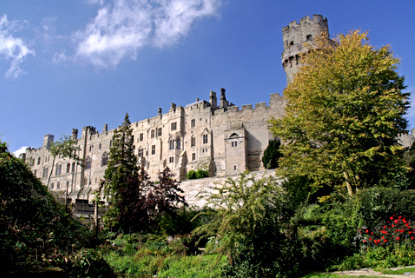 Definitely one of the most beautiful medieval castle around, Warwick is also one of England's most visited attraction - except queues in summer. William the Conqueror ordered the construction of the first castle here in 1068, although the present buildings date from the latter-half of the 14th century. 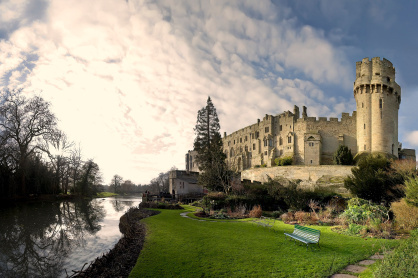 Warwick has had a turbulent history, with the title of Earl of Warwick passing successively from the Newburgh (1088-1242) to John Du Plessis, William Mauduit, then to the Beauchamp (1268-1449), Neville (1449-1471), Plantagent (1471-1499), then becoming property of the Crown under Henry VII and VIII, then to the Dudley family (1547-1590), the Crown again, before returning to the new Earls of Warwick, shared between the Grevilles and Richs since 1604. In 1978, Tussauds acquired the castle, which explains for the numerous wax figures inside. The most famous occupant was probably Richard Neville (1428-1471), nicknamed "the Kingmaker". He was the richest man of his time in England and managed to depose Henry VI in favour of Edward IV, then back again to Henry VI before being killed in battle by Edward IV's forces. A complete description of the castle and its history is available on the castle's official website. 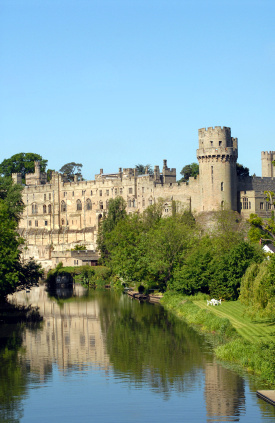 Warwick Castle is open from 9am to 6pm from April to September (high season), and 9am to 5pm the rest of the year. Admission prices vary with the season. Tickets cost (high/low season) £14.95/12.95 for adult, £10.95/9.95 for students, £10.75/9.25 for seniors, £8.95/7.95 for children or £42/34 for a whole family. 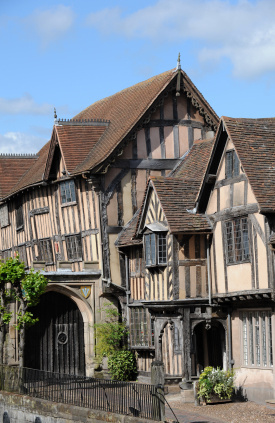 Among Warwick's fine historical buildings, the most impressive is without doubt the timber-framed 16th-century Lord Leycester Hospital. 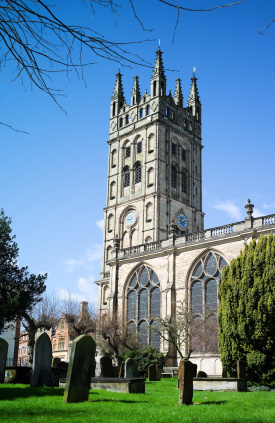 The Collegiate Church of St Mary suffered badly from the 1694 fire, but is worth visiting for its Beauchamp Chapel, which includes a statue of two Earls of Warwick, Thomas de Beauchamps and Richard "Kingmaker" Neville. Trains link Warwick to London Marylebone (1h40min, £14.90), Stratford-upon-Avon (20min, £3.30) and Birmingham (35min, £3.90). National Express has buses to London (2h45min, £13.50), Birmingham (55min, £6) and Leeds (5h, £22), among others.